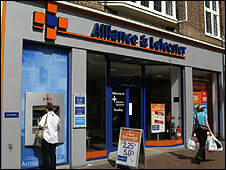 Alliance & Leicester (A&L) bank shareholders have overwhelmingly approved the proposed £1.3bn takeover by Spain's Banco Santander. Investors holding 96% of the bank's shares voted in favour. The minimum requirement was 75%. The vote to accept the takeover came as shares in banks across Europe fell heavily following the demise of US investment bank Lehman Brothers. A&L had warned that its prospects as an independent entity were not good. 'We welcome our shareholders' approval of the offer from Santander, which was unanimously recommended by the Board of Alliance & Leicester," said Roy Brown, the bank's acting chairman. "The economic outlook and continuing uncertainty in financial markets have reinforced the board's view that this transaction is in the best interests of shareholders, customers and other stakeholders," he added. Last month A&L sent a letter out to more than 560,000 shareholders urging them to support the deal. The extraordinary general meeting took place at Birmingham's International Convention Centre. A&L shareholders will get one Santander share for three A&L shares as part of the takeover offer, which was announced in mid-July. Under the terms of the takeover - which is expected to be completed in October - A&L will then be merged with Banco Santander's existing UK subsidiary, Abbey. This will create a much larger bank with 959 branches and 10% of the UK's bank current accounts. With the credit crisis wiping out most of A&L's half-year profits and the continued high cost of securing funding in the wholesale markets, the bank's board had been keen to insulate itself against a worsening economic backdrop.